Barnaby Brown from Scotland and Gianluca Dessì from Sardinia plunder the indigenous classical traditions of their native isles to weave a contemporary sound. “Bandre” is the vocal version of the most exciting embellishment in pibroch, and the duo Band-Re run riot with Scottish, Sardinian, Arabic, and Balkan art, challenging boundaries and intoxicating listeners with their improvisatory, in-the-moment music making. Barnaby (Glasgow) abandoned the bagpipe when he was 13 to pursue the orchestral flute. Ten years later he saw the light, returned to the classical music of the pipes and settled in 17th-century Scotland. He was in the middle of studying Gaelic when an ancestor of the bagpipe took him back another thousand years and transplanted him to Sardinia. Gianluca found him playing the triplepipe by a bronze-age fort and has been coaxing him back into the 21st century ever since. Gianluca (Sassari) was too much of a maverick to stick the conservatoire and left to make his mark on the folk music scene doing what he does best—his own thing. That said, he couldn’t resist the urge to go back and study ethnomusicology. Gianluca spends a great deal of time on his mobile, organising concerts for other artists and regularly taking Sardinian musicians abroad. 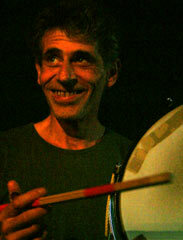 Described as “the best Celtic sound ever to come out of Italy,” Gianluca prefers to reserve judgement. Andreu (Girona) was born with bells on his toes. Percussion is just an extension of his hands and limbs. 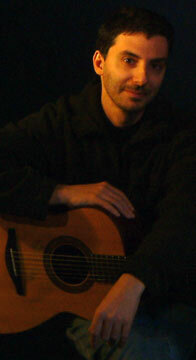 He plays with leading Catalan singer Maria del Mar Bonet, amongst others. We first jammed together at a festival in San Teodoro; it was as if Andreu had always been there. He is one of the most gentle, laid back people we’ve ever met. We thank him hugely for making Strathosphere something else, and for the authentic Crema Catalana recipe.